For the first time, I was discipline enought to moisturise my terribly dry legs the night before without being reminded to - even my freshly manicured fingers and pedicured-toes was not spared. 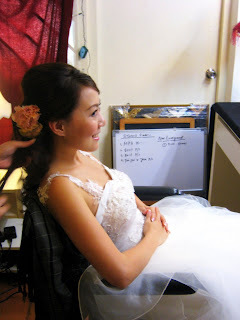 Left Dew's hse at 7.50am to pick up my photoshoot bouquet at Fleurlicious. 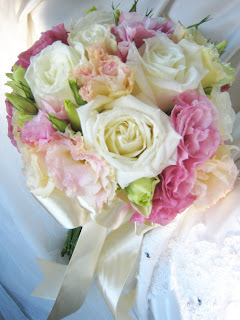 Very beautiful posy of pink, champagne eustomas and white roses. Looks like those from the glossy magazines. Impressed! Indoor photoshoot for Yukata, Evening gown and Actual Gown before we break for packed-lunch. We ended the shoot at about 5pm and went back to Eric's studio to pack for our next round of night shoot (with complimnets from Dew's buddy - Rodin). Ended at 11pm. Deadbeat at the end of the day. facial muscles can' even managed a smile wen dew told me a joke. No joke!